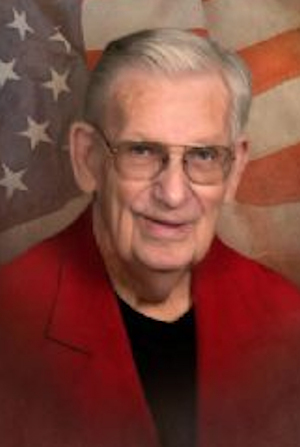 Obituary – Laughlin, James Arle « Perry High School Alumni Association, Inc.
Jim Laughlin longtime Kay county resident passed away Sunday, January 15, 2017 in Ponca City, OK. He was 90 years of age. Jim was born March 6, 1926 in Stillwater, OK to Arlo A. and Katherin Sechrest Laughlin. Funeral services will be held 2 p.m. Thursday, January 19, 2017 at Grace Memorial Chapel with Chaplin Mike Sweetman officiating. Interment will follow in the Longwood Cemetery. Arrangements are under the care of Grace Memorial Chapel. Jim grew up in Noble County and he married the Love of his life Nadine Milliron on June 6, 1950 in Perry, OK and they made their home in Ponca City, OK.
Jim served a tour of Duty in the U.S. Navy, after his honorable Discharge he went to work for Conoco and he retired in 1981 with over 35 years of service. Jim enjoyed playing golf, traveling and fishing. He was also a past member of the Huff – Minor American Legion Post 14, Moose Lodge and the Masonic Lodge. Survivors include: wife Nadine of the Home; 2 sons: Terry and wife, Patty Laughlin, of Cedar Hill, TX and Mike and wife, Leetta Laughlin, of Ponca City, OK; 2 grandchildren: Cory Laughlin and Aaron Laughlin; and 7 Great grandchildren. Jim was preceded in death by his parents and 1 grandson, Steven Laughlin.